As a follow up to the recent posts on Growing Eggplants and Controlling Flea Beetles on Eggplants, I wanted to share a few rare and unusual varieties of heirloom eggplants that are available to the home gardener. Do a little research and you’ll quickly discover that eggplants are well traveled and a very international vegetable. There are many exotic varieties hailing from remote regions of Turkey, Africa, Italy, Thailand, India, China, the Ukraine, and Louisiana. One thing that has always been a constant for me is that if I plant a single eggplant, flea beetles are guaranteed to make an appearance. For some reason these difficult to control pests are especially fond of eggplants and if left unattended will quickly chew hundreds of holes through the plant’s leaves. Eggplants are one of my favorite vegetables to grow in the garden which is strange considering that I refused to eat them as a kid. Now I love eggplants in and out of the garden. There are about twenty plants of a dozen different varieties of heirloom eggplants growing in my garden this season. I receive plenty of comments, questions, and feedback to an earlier post about Growing Goji Berries so I thought it was about time for an update on the progress of my Goji Berry plants. I would also recommend that anyone interested in the topic browse the Goji Berry comments for advice and helpful information provided by other backyard Goji Berry growers. For garlic growers like myself that do all of their garlic planting in the fall, spring is a pretty care free period provided that your garlic is grown in fertile soil and the bed is mulched with a thick layer of shredded leaves or straw. Despite the similarities in habit and appearance to the popular tomato vine, you won’t find tomatillos growing in too many backyard vegetable gardens. This unusual plant is rare in the home garden, but the fruits are popular in salsas and many other ethnic recipes. The spring veggies are maturing or approaching harvest time and the garden is yielding Kohl Rabi, broccoli, green garlic, and huge, sweet heads of red and green varieties of heirloom lettuces. 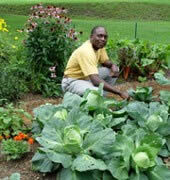 Overall the garden looks good and is showing promise of a great growing season.